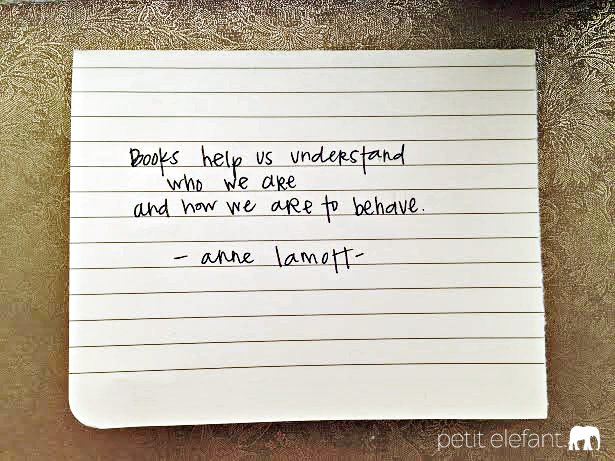 Today, a great quote about books from one of my favorite authors, Anne Lamott, for the Petit Elefant Quote of the Week. I’m not totally sure what rock I’ve been hiding under, but I’ve only recently discovered Anne Lamott. Like, in the last year and a half. And since I found her, I’ve been obsessively reading everything I can get my hands on. I just finished reading Operating Instructions: A Journal of My Son’s First Year, and am halfway through Bird By Bird: Some Instructions on Writing and Life. Lamott’s writing is so important to me, it resonates so thoroughly in my brain, that I try to ration her books like I would, say, chocolate. Only it doesn’t work. I end up plowing through, staying up way past my bedtime to see what other revelations she has to offer me. We’re lucky if once in a lifetime we find an author who speaks to us completely, and even if I’m late to the game, I’m happy to be here now. On a side note, totally related, if you’re looking for some good books to read, I just posted my most recent book review, 5 of the best books on my reading shelf right now. But onto the quote. Here’s my favorite Anne Lamott quote right now. Isn’t it perfect? and how we are to behave. I think I’ve read all Anne Lamott’s books; she’s a terrific writer.